Biodiesel is registered as a fuel and fuel additive with the EPA and meets clean diesel standards established by the California Air Resources Board (CARB). B100 (100 percent biodiesel) has been designated as an alternative fuel by the U.S. Department of Energy and the U.S. Department of Transportation. Moreover, in December 2001, the American Society of Testing and Materials (ASTM) approved a specification (D675) for biodiesel fuel. This development was crucial in standardizing fuel quality for biodiesel in the U.S. market. Diesel fuel specification (D 975) has worldwide acceptance. The most commonly used blend is B20. Biodiesel is a liquid fuel made up of fatty acid alkyl esters, fatty acid methyl esters (FAME), or long-chain mono alkyl esters. It is produced from renewable sources such as new and used vegetable oils and animal fats and is a cleaner-burning replacement for petroleum-based diesel fuel. It is nontoxic and biodegradable. Like petroleum biodiesel it is used to fuel compression-ignition (diesel) engines. 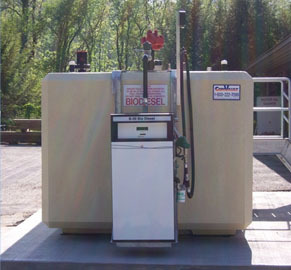 Biodiesel has physical properties similar to those of petroleum diesel. Go to the links below for more detailed information. Blue Ridge Biofuels (BRB) is the region's only biodiesel producer. BRB began as the Asheville Biodiesel Coop, a group of Biofuels advocates who collaborated to make their own biodiesel for personal use. In 2005, four members of the Cooperative created BRB to provide biodiesel to customers across Western North Carolina through several retail outlets that can be found at the Blue Ridge Biofuels link below. All biodiesel is produced from reclaimed vegetable oils and animal fats with a current potential production capacity of 1 million gallons annually. WNC Biofuels -1 from Industrious Productions on Vimeo. WNC Biofuels - 2 from Industrious Productions on Vimeo. o	NC State Contract Note: Purchaser must be a municipal, state or federal government entity qualified to purchase through North Carolina's State Procurement System.